Holding your brush pen at an angle towards the paper is very important for achieving strokes in varying thickness. 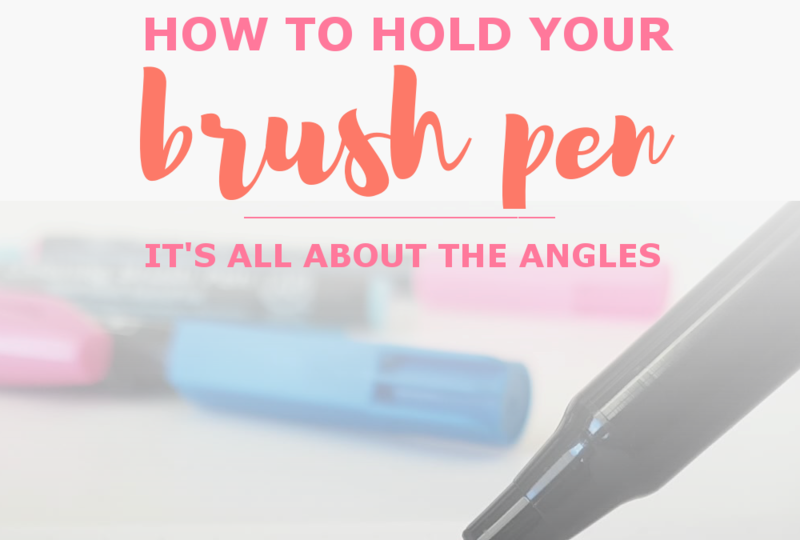 Avoid holding the pen upright where the end of the pen points toward the ceiling. Try to decrease the angle of the tip towards the paper as much as you can while making sure you still have a comfortable grip. You’ll notice as soon as you apply pressure at the pen held in this way the flexible tip bends over the paper and the strokes produced are thick. A difficulty that will arise with this hold is maintaining control of the thin strokes. You want only the tip of your pen lightly touching the paper with no flex (see video below) which can be hard as you just learned how to hold it for optimal flex. There might be shaky or uneven lines but it’s all part of the process. The slower you make the strokes the better control you’ll learn. When focusing so hard on thickness, the lines evenness, how slow your going and keeping the same hold and angle, its common that your fingers tighten around the pen unintentionally. Try keeping a light grip on the pen with every stroke so you practice good techniques that build your hands muscle memory. It’s harder to undo a habit of a tight grip once it settles than it is to keep in mind a light touch as early as possible as you practice. And all of these things can sound overwhelming to keep in mind all at once but don’t let that discourage you! Trust me, just keep up the practice and you’ll be doing it on autopilot soon! Go slow to maintain control over the strokes. Loosen your grip, not so light that the pen is loose in your hand but not so tight that it effects you’re overall control. It can be hard to achieve straight thin lines with a tight grip. And just because someone says this is the way to hold these pens doesn’t mean its the only way! If you found that your grip and technique is serving you well, keep using it. Let me know in the comments how these tips works for you or if you have a tip of your own! This is amazing! So proud of you, Rim. Excited for what’s to come!!! Add me to your list. Thank you all your calligraphy tips!! !